I would love to be your guide in getting started with essential oils and a more holistic, less toxic lifestyle. This is like having a Costco membership, but with more benefits. You don’t have to sell essential oils or start a business to get this discount. Optional: Build a doTERRA business and earn commissions from the company for teaching a natural lifestyle with essential oils. A starter kit saves you money, gets you on the fast track to using essential oils for your health and wellness, and the membership is free. The Home Essentials Kit is a great kit for somebody who wants to start with the basics and really get to know the top 10 oils. This is a great starter kit and can provide amazing benefits for everyone, especially since it includes a diffuser! This kit is a favorite enrollment kit. It sets you up with all the essentials for big changes in your wellness. The products in this kit will support and improve your immune system, emotional health, cleaning, support restful sleep, ease feelings of stress, improve focus, and support healthy bones and muscles. Essential oil options for immune system, healthy joints and muscles, mental focus, sleep, energy, and more. Wooden box for essential oil storage. Get on the fast track of earning 15%+ back in free product credits every time you order on the rewards program. Supplements for you and your kiddos as well as 10 of the most popular oils and blends in pre-diluted rollerballs that are amazing to have in your purse, car, or diaper bag for a quick swipe on the bottoms of little feet or the back of the neck. doTerra has already perfectly diluted them so there is no mess and no fuss when you are on the go and need a quick, natural solution. Want to see more kit options? Become a member of our private Facebook community to learn and share ideas on using essential oils. Fill out the form below, and I’ll be in touch! I want to purchase essential oils and get a wholesale membership. I want to purchase oils at retail price. 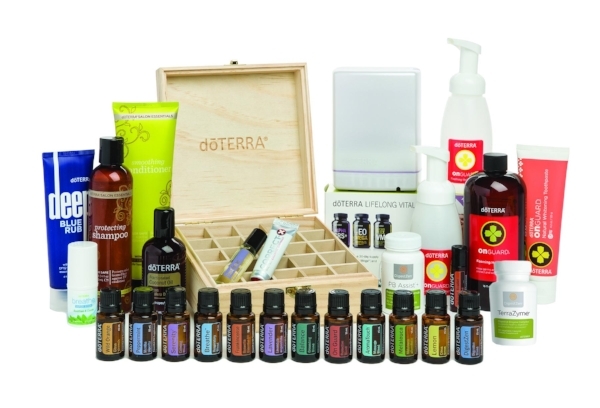 I'm interested in becoming an essential oil educator and to start a biz with doTERRA. Not sure - I need more help or information. Ready to get your Essential Oils? Clicking “Buy Now” will take you to my online doTERRA store, where you can choose to “Join” if you’d like to purchase products at wholesale price. After your purchase is complete, you'll receive a couple of emails from me. One of those will include some options for scheduling your 30 minute call, or you can schedule your call HERE.